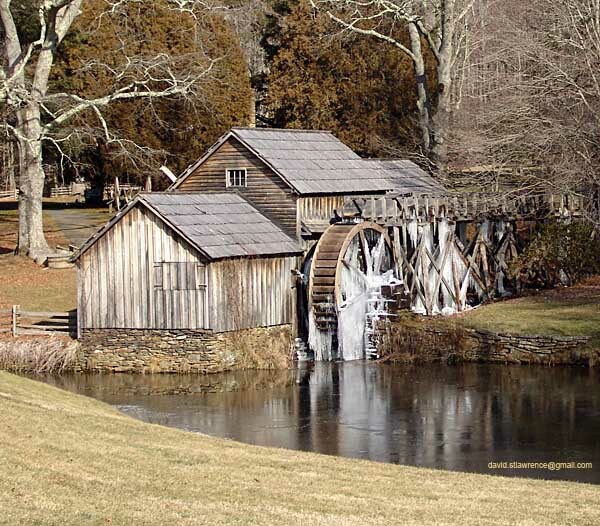 We drove up the Blue Ridge Parkway last week and found scenic Mabry Mill firmly in the grasp of winter. The wheel is frozen firmly in place and the mill pond is skimmed over. A few ducks float in the icy water, somehow defying the bitter cold. The temperature in Floyd County has lingered in the teens for several weeks with only a few excursions into higher ranges. I am wearing flannel-lined jeans and extra layers of fleece every waking moment. I am even thinking of getting one of those fur hats with earflaps. The woodpile on the porch has to be replenished every few days as the wood stove inhales logs like an old-time chain smoker. The Dutchwest stove is giving great service and my home-made stove handles are holding up just fine, but the fire has to be kept going in order for us to work comfortably and efficiently.. The only drawback of a wood stove in my mind is that one has to remain vigilant and load a new log in the stove every 30 minutes. My problem was that I would be writing away on the computer and didn’t keep my eye on the fire and by the time I noticed that the room temperature had dropped, there would only be coals left in the stove. It would take only a minute to recharge and relight the stove, but I knew there had to be a better way to remind me of the passage of time when I was working on the computer. I installed this Secs desktop timer program which beeps to remind me when it’s time to get up from the computer and put another log on the fire. If you are a heavy computer user, you may be interested in reading further. and helps me keep the fire going at the same time. you do most on it. I will let you know if it I find it useful. This entry was posted in Country Living and tagged home business tips, Secs, software timer, stove handles. Bookmark the permalink. I thank you so much for the timer tip. I live in rural Maine and I can’t tell you how many times I’ve left the fire too long while engrossed in a computer task. I’m off to get the SECS app now.